I've been attracted to classical education since I first began researching homeschool methods. "Living" books are so much more interesting than textbooks, and there's a lot to learn that isn't offered in the typical curriculum. I don't remember ever being introduced to the great artists until I began teaching art appreciation to my own children. Classical education is language-based, rather than image-based. Some of our family's most successful learning experiences have centered around a good book! When lively discussion accompanies shared reading of a story, my children absorb information without even realizing it. I've found this method to be much more effective than giving them a book to read and a test to follow. Classical education also recognizes that all knowledge is interrelated. Especially in a home school setting, it isn't necessary to neatly compartmentalize the various subjects, studying social studies from 8:00 - 9:00, science from 9:00 - 10:00, and so on. Becoming immersed in an excellent storyline allows a student to experience cultures, explore history, appreciate art and music, and assimilate scientific facts in a natural manner. With this philosophy, it might surprise you to learn that I have used an animated, online program for our family's core curriculum for the past several years. Time4Learning is image-based learning at its finest, and the very idea might at first cause die-hard classical educators to cringe. I've found it to be an excellent companion to our unit studies, enriching my children's educational experience and even improving our family life. Classical education is an excellent way to teach history, geography, and science. Although it provides some practical application of reading and language skills, classical education is deficient in math instruction and formal phonics and grammar lessons. These subjects must be taught separately. Classical educators naturally look for classic, textbook-based math and language programs to complement their eduational philosophy. Frankly, I've found these programs to be incredibly dull, full of rote memorization and drill. One of the attractions of classical education is that parents and children usually find their studies fascinating. It seems contradictory to choose a math program that bores your students to tears. Another thing that's important to a classical educator is a well-rounded education. In attempting to provide a variety of learning opportunities, classical educators often focus completely on "classic" material, ignoring important new skills their student will need to succeed in today's world. Classical education requires a lot of time from a homeschooling parent. After the planning, a parent must be directly involved in most of the instruction. While many of us enjoy this time with our children, it is difficult to sustain that level of interaction on a daily basis. When "life" gets in the way, unit studies are hit-and-miss. Enter Time4Learning! This program's phonics and language arts programs are among the most engaging I have seen. My kids actually look forward to those two subjects. The lessons are visual learning in the extreme: highly interractive, silly, and loads of fun. By using an online program for language and math, I think my children get the best of both worlds: a classical education with a twist! That's MY idea of a well-rounded education. Since the computer lessons are generally done independently and the program even grades their work, more of my time is free. I can use it to enrich our unit studies or even to catch up on the housework. And my kids are learning important computer skills without even trying. Time4Learning is a complete core curriculum, aligned with state standards. Combined with unit studies for enrichment, it has helped me provide my kids with a quality education and kept more of my time available for the million things that might arise in a homeschool mom's life. Even on days that Time4Learning is all we do for school, I know we've done more than enough. Until recent years, textbooks used to be one of the only tools available to teach your children with... and they’ve done a good job. But “doing a good job” doesn’t necessarily mean that your children are learning at their full capacity. Years of research prove that students have learning styles as unique as their personalities. Some are visual learners; others are auditory learners. Many need repetition, interaction or a combination of techniques. And even though your technique “works”, it’s okay to ask yourself if there’s something better around the corner. It’s a natural concern. This is the education of your children, after all. So, how do you really know that your children are working up to their full potential? Well, you could start by identifying their primary learning style and compare them to your current method. 1. Visual learners prefer to see what they’re learning. They often need to write down directions and may have trouble following lectures. 3. Kinesthetic (or tactile) learners prefer activities that let them do what they’re learning about. They like to touch, build, and interact. They often move around when talking or listening. An online learning program is a great solution to catering to all of these learning styles. Time4Learning's visual, hands-on and auditory program helps harness learning styles to make the learning experience as positive as it is productive. The online learning system evokes the different learning modalities and works for a broad set of learning styles. This lets parents hone in on the technique that works best, making it easier for kids to absorb and retain their lessons. So, the question becomes this. If you found a learning tool that awakened new potential in your kids, would “doing the job” be good enough, anymore? Take some time to find out if there is something better out there… or (at the very least) confirm that your current teaching style really is the best approach for your kids. And who knows? You could tap into potential you didn’t even know was there. When our family began homeschooling, I purchased a spelling workbook from a popular publisher. It was the typical format. The child was given a list of words on Monday. Throughout the week, they were provided with activities designed to help them learn how to spell the words. On Friday, they took a spelling test. I was dissatisfied with the program for several reasons. My older children were often required to spend time studying words they already knew how to spell. My younger children were sometimes overwhelmed by too many new words at the same time. When my students missed words on their Friday spelling tests, the opportunity to learn that word was gone, because it never appeared on their spelling list again. The study activities were, frankly, boring! There was more grumbling than usual in our homeschool each time the workbook instructed them to "write each spelling word five times." Abandoning the spelling workbook, I began collecting the words each child misspelled in their daily school work, to provide them with customized spelling lists. I scoured the Internet for interesting ways to practice their words. We wrote spelling words on the sidewalk in chalk, formed spelling words on the refrigerator with magnetic letters, and stamped spelling words in ink. When they missed words on Friday's spelling test, they were given those words again the following week, with just a few new words added. An interesting thing happened. I rarely had to re-assign missed words. Everyone started getting 100% on their spelling tests. The grumbling stopped, and the children began to look forward to practicing their spelling words. Eliminating the boring, repetitious spelling practice and replacing it with more interesting activities worked! A bored brain apparently doesn't learn as readily as one that is actively engaged. I don't have to work quite so hard these days to find fun ways to practice the week's spelling words. We practice online at SpellingCity. With activities like HangMouse, a cute variation of hangman, my kids look forward to spelling. Many of the activities, such as crossword puzzles and word searches, can also be printed. You can use your own spelling lists, or find lists other users have shared. For those who prefer a more traditional approach, SpellingCity provides an online spelling curriculum with suggested lists already prepared. SpellingCity is a free program for all ages. It's a real timesaver for me, and my children love it. Can you use an online curriculum for several children if the whole family shares one computer? Sure you can, with a little planning! Even if they use an online curriculum for the core subjects, most homeschooling families will include offline activities, too. Penmanship, arts and crafts, journaling, sports practice, music lessons, and Scouting activities all have their place in a child's school day. 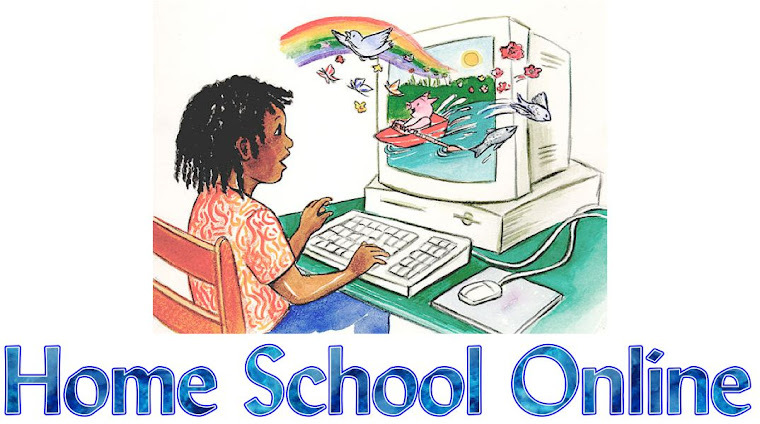 One student can be scheduled to work on the computer while another completes an art project and a third practices penmanship. Don't let the word "schedule" cause alarm! A schedule can be as rigid or as flexible as you need it to be. I use a simple grid, with each family member's name noted across the top and times of day listed on the left. There's no need to schedule every minute of every day. By filling in just the most important details, I can see where each person is supposed to be at any given time, all on one page. This kind of loose planning was essential when we had four children sharing one computer. Other shared belongings that have appeared on our schedule are the piano, a DVD player, and a microscope. Our family is fortunate to have had a computer for everyone in recent years but, with only one full bathroom, we still have to schedule our showers! Homeschoolers get used to answering questions. It's natural for people to be curious about unconventional choices. One of the questions I am asked frequently is, "How long are you planning to homeschool?" Families choose homeschooling for a variety of reasons. Many students start out in public school and are withdrawn to deal with specific situations such as illness, personality conflicts, or the need for extra tutoring. In each of these cases, the student will probably eventually return to a traditional school. For our family, homeschooling is a lifestyle choice. Two of our six children have graduated from our homeschool high school, a fact that often generates additional questions: Can you DO that? How do they earn credits? Who issues the diploma? Will they be able to attend college? New homeschoolers are often surprised and relieved that homeschooling through high school is an option, although they have the same questions as the simply curious. There are numerous online high schools and correspondence courses, where the student eventually earns a diploma from an accredited school. Although this is "school at home", it is not "homeschooling" in its purest form. We have not chosen an accredited school, because our goal is to provide a customized educational experience for our children. We don't want to be limited by a particular school's schedule or course offerings. So, how does a mere parent develop a high school plan? It's not as difficult as it might seem. Remember, graduation requirements will differ, even among public schools. Some schools require four language credits and two math credits. Some will settle for three language credits, but want the student to earn three math credits, too. There are even variations in how many hours of study constitute a "credit", typically ranging from 80 to 120. Planning: In our homeschool high school, 100 hours of study equals one credit. I expect my high schoolers to earn a minimum of five language credits, three math credits, two social studies credits, two science credits, two fine arts credits, one foreign language credit, two PE credits, one life skills credit, one driver's ed credit, and six elective credits, for a total of 25 credits to graduate. Compared to other high schools' requirements, 25 is a lot. I also require many hours of community service. Record Keeping: We keep a log of the children's studies. The log includes a brief description of the activity, the class or subject, and the amount of time spent. A typical Monday entry might read, "Online algebra course, math, one hour. Swim team, P.E., two hours. Cooked dinner, home economics, 45 minutes. Research and notes for essay, language arts, 1/2 hour. Watched Civil War documentary, history, one hour." At the end of each school year, I total the hours spent on each subject and transfer the information to my student's high school transcript. Since transcript formats will vary from school to school, I was free to simply choose one I liked from samples available online. The transcript is placed in my child's portfolio, along with examples of his work. Some people use notebooks for portfolios, but I have used an accordion file in recent years because I think the punched holes detract from the professional appearance of the documents. Choosing Curriculum: It can be fun to shop for curriculum for traditional classes, such as math and language arts. Textbooks and online courses such as Time4Writing fulfill many of the requirements. These are straightforward and easy to log. Sports activities and music lessons fulfill other requirements. I try to get photographs of my children engaged in these activities, as well as letters from their coaches and music teachers. These go into the portfolio, along with recital programs, ribbons earned, newspaper accounts, and other "proof" of participation. Customizing Curriculum: Elective and nontraditional classes are your chance to get creative. Work with a high schooler to develop a plan that addresses his eventual goals. Our state requires 100 hours of driving instruction before a student can receive a driver's license, so a photocopy of our child's license is all we put into their portfolios as "evidence" that they've earned a driver's ed credit. One daughter was instructed to cook dinner once a week during the school year and was given a list of meal types to provide: two casserole meals, six ethnic meals, two crockpot meals, one formal dinner, etc. Allowing for her research and planning, she earned half of a home economics credit during the school year. "Life Skills" hours are logged when the student is assisted with such things as opening a bank account and filling out job resumes. A student's employment offers another opportunity to earn credits. If they count change, a percentage of hours employed can count toward "Practical Math". If they use a computer, some of the time can be logged as "Computer", "Data Entry" or "Keyboarding" classes. Of course, there are formal "Home Ec" and "Driver's Ed" courses available, but don't feel you are cheating if you choose a more casual method. Even traditional schools offer credits for work experience and for "classes" such as "teacher's aide", where the student helps grade papers, organize the classroom, and so forth. Diplomas: A diploma can be generated at home on your computer, or there are many places to order a more professional appearing document. A homeschooler's high school diploma is signed by the parents. Diplomas are essentially keepsakes for the student's enjoyment, with colleges being more interested in a student's transcript, portfolio, or test scores. Career Options: The vast majority of colleges accept homeschooled students, with admission requirements ranging from testing to a portfolio evaluation. Many colleges actively recruit homeschoolers. A student can honestly answer "yes" on job applications that ask if they are a high school graduate. The occasional reluctant employer can usually be persuaded when provided with a copy of the state's homeschool laws and the student's homeschool diploma. The National Guard now accepts homeschooled students and recently issued a brochure specifically designed to recruit students educated at home. Graduation: To assure that they're ready to graduate, our children take the ASSET tests at our local community college. Some families rely on standardized tests from previous years or have their students obtain a GED. Other families "just know" it's time. Many homeschool co-ops offer graduation recognition ceremonies. 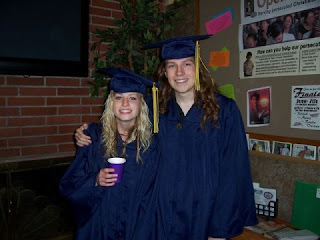 Our family's most recent graduate and her cousin were happy participants in our co-op's graduation ceremony this year.